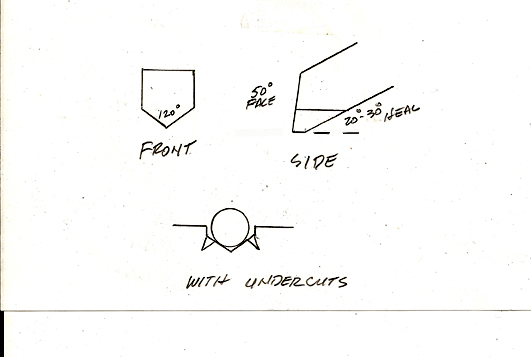 Here is a drawing I did of my inlay tool. Joe, Thanks for the diagram. Kevin - thanks for the diagram too. It's fascinating to see all the different methods. I've been trying some of them and it's cool how they all accomplish the same goal, but get there differently. Marcus, if you get a chance to photograph your tool that would be great even if it's in a while. Interesting thread. I work sort of like Sam. I cut my straight lines with a 90 and then open them up and deep with a regular flat graver the width I want my line to be. But then I do not undercut it. I tooth the bottom of the cut to hold the gold and this way i have no lip to sand down afterwards. I do us a onglette for the curves and punch undercut them in the traditional manner. My way of doing it looks a lot like Joe's Except I am using a 90 rather than a 120. I do undercut but I keep my undercuts in the bottom half of the channel so I don't get a lip like Marty mentioned. I like this method because it produces sort of a forcing cone in the bottom of the channel that splits the gold wire and guides it into the undercuts on each side. I learned about this tool from Ray Cover about 4 or 5 years ago. It started off as a 90 degree point. The 90 point would always break on tight turns. I went to a 120 point and that really helped with that problem. I showed the undercut at the top of the 120 cut. Now that I think about it the cut is much larger than that. 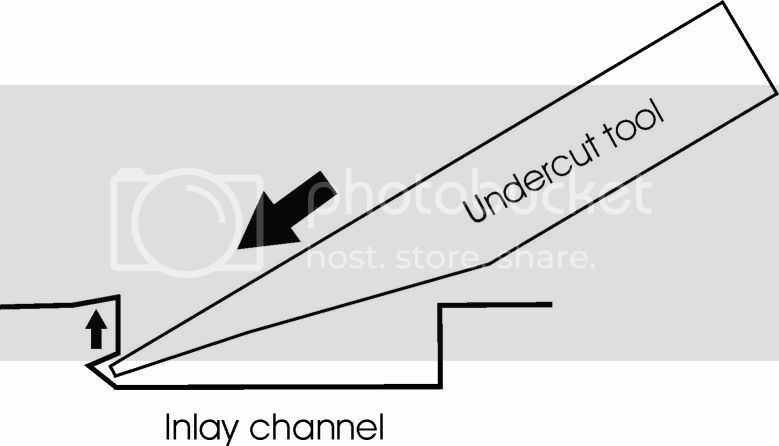 I use a very small flat point to cut the undercuts and it starts high, but that area is so small the cut come out at the bottom at the point of the channel. Sometimes the corner of the tool may mark the bottom of the other side of the channel. Hope that makes sense. The great thing about this tool is the speed. 3 or 4 passes and you are ready to undercut. Tira, It would help me to see what other engravers use as undercut tools. What's really interesting is to see what techniques and tools others have developed and/or adopted and modified over time to suit their needs and to find out that what I've come up with ain't too far off. I abandoned the flat graver as an undercutting tool when I kept trashing the opposite side of the inlay channel ... especially when inlaying wire under 1/4 millimeter. I made a miniature, offset, flat tipped graver that allows you to get lower without trashing the opposite side of the channel. Since this photo was taken, I've modified the tools taper from 20 degrees to 15. The sides are tapered at roughly 25. Once it is a razor sharp, narrow, flat tip, I knock off the point on the porcelain wheel to eliminate the probability of tip breakage while facilitating the tool's ability to push material. It's still sharp enough to raise teeth along the bottom of a very narrow channel too. For punching the undercut around curves....round the face of the tool and the sharpening bevel also. I have these in various curves to fit the scroll. Flat for straight lines and curves for curves. Mitch: After Lynton showed me his technique I used it for a lot of years with good results. 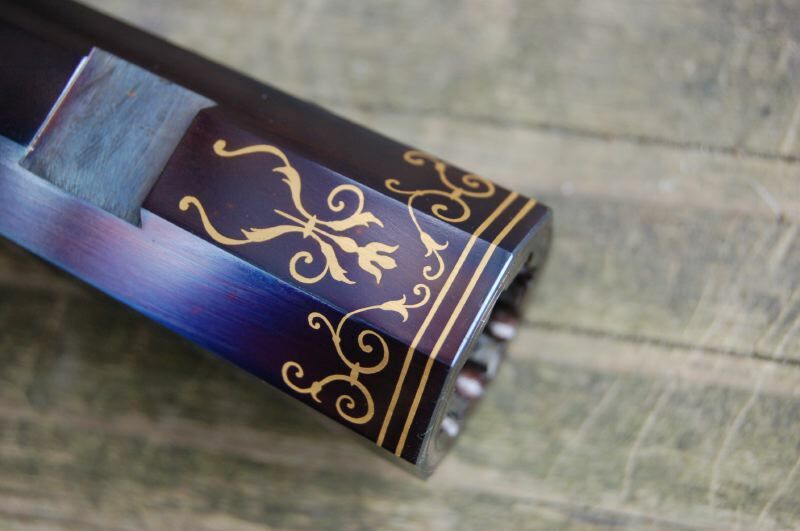 Years later I was talking inlay with Churchill and he told me he simply lifts up the edge of the channel with a flat graver to form undercuts. So there were two of the world's best doing it two different ways and both getting fantastic results. In teaching I will say that the McKenzie method is quite difficult for beginners (especially when inlaying thin lines) while the other method is fairly simple. What I like about McKenzie's method is that displacement is kept to a minimum which is important when it comes to engraving around the hinge pin of high-end custom knives and upsetting their tolerances. Both methods work and I use as needed. Chris the picture of the tool you use looks different than the drawing. The tool in the picture looks to have a curve very near the tip while the drawing is straight all the way. In chasing /repousse I use a tool called a dog leg. It's used to move metal in a certain way and the dog-leg shape allows it to be held in a more vertical position. Your tool looks similar to that shape just with more of a bend. It seems this shape might help in avoiding damage to the opposite wall. The name suggests a dog's leg with the paw. I want to make it clear; I have not used this technique in inlay. I have used it in repousse. I thought I'd mention it anyway. At some point I plan to actually try it out in gold inlay. I used a 90 for most of my line work. Undercut the sides with a knife on the straight runs, and various wee tools in the tight spots. The tool is not just literally on its' side but laying on its' flat side. (...if that makes sense). The tip is actually not bent upward but looks that way. Two ways to sharpen it .... either tapering the flats or tapering the edges. I tapered the edges/corners, just as you would a graver, so I could also use it in my Airgraver without re-adjusting the set screws. Thanks to everyone who has taken the time to post information into this thread. It has been very helpful to me and a wealth of information for the future. If anyone has other undercut tools not already mentioned - please post pictures and/or diagrams. It has been fun trying out new methods! I learned my undercutting from Robert Evans. The tools are identical to the ones Mike Dubber uses. Undercutting style varies depending on what you want the gold to do. At time you don't want it to move or creep and at time you want to push the gold to a bigger part of the inlay or wider part of the line. A solid undercut will allow it to move. intermittent undercuts will tend to hold it from moving and so will teeth set in the bottom in different directions. I know all the professional engravers are aware of these tricks but it may be of interest to some of the newer people. Forgive me for being off subject but somehow we got into undercutting. I would like to know different techniqes for undercutting very small and narrow lines like .005 or less. You mention the gold moving or not moving. In recent years I have been putting little teeth in the bottom of the channel to hold the gold but it also keeps it from moving. I use air assisted graver to set the gold as well. If you hold the tool at a slight angle you can go right along and set the gold plus it sort of acts like "plow" as the gold will build up at the punch and fill any of those deeper cuts but the back of the punch will peel off any excess. It has made gold line inlay 3 times as fast for me. Before if I had an area cut too deep, I would need to get a larger diameter wire but this method, the excess is flowing ahead and will fill those areas. You need the teeth in the bottom to keep the gold from sliding in the groove however. Chris could you give the dimensions of the pictured undercut tool? Hmmmm........all I can really tell you is what I am using this week as it seems to change from time to time. Currently I am cutting most of my straight line with a v shaped tool that I make out of a flat so the sides are essentially vertical but.....instead of a 90 or 120 I am using a 150. My reasoning is that it leaves more vertical wall which seems to hold the gold quite well. If I get a little overzealous in my sanding the vertical wall will maintain a uniform width. The v shaped front helps the tool cut a little straighter without drifting as can happen with a flat. For undrcutting you can usually use the same tool and hold it more upright and raise burrs in the bottom of the channel. For curved lines I do it more or less like Marty and undercut with a curved face. If it's a little wider line the burrs can be raised in the bottom. I will give this a try. I just took a flat and put a 120 on it today but I think a 150 or so would even be better.